What should really have been one of the worst nights for star-gazing happened this year to be both a moonless and cloudless night here in Galicia. So, I got a few people interested and we all headed up Pico Sacro a little after midnight to go see the stars. Pico Sacro is a hill around 20 minutes outside of Santiago, and deep enough into the countryside to have little light pollution. Indeed half way up the hill you are surrounded by trees and there are a few fine spots to stop at the side of the road and marvel at the night sky. 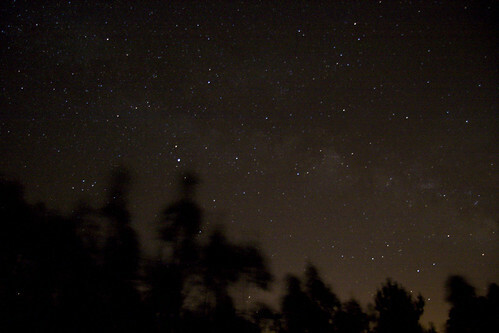 Indeed it was just as I'd hoped and the swathe of the milky way was very clear. Unfortunately my knowledge of the positions of nebulae is pretty poor and so I wasn't quite sure where the biggies were sitting in the plane of the galaxy. Andromeda was not visible from where we were but looking at my photos after I see that the Lagoon nebula was sticking out very clearly and the Triffid nebula and Eagle nebula would have been easy to spot had I known quite where. Still, this is a learning experience and next time I'll have a much better idea. It's amazing the detail you can pick up with a truly bog standard digital SLR. If the weather continues like this, I may go again next weekend and by then I should have a Manfrotto to my name which will help with the stability issues. 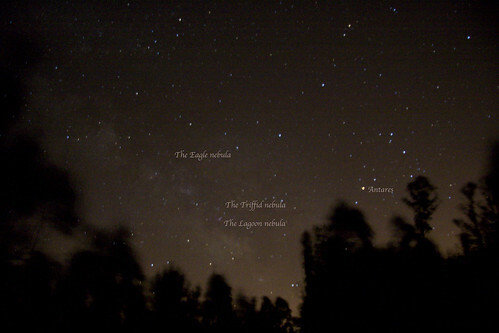 The nebula I looked up afterwards using Stellarium.